Our roots began in 1977,when a few weavers began meeting in each other's homes to encourage innovation and learning. Member Daphne Malins designed and wove her Okanagan Tartan which she registered with CIPO and as a Scottish Tartan. 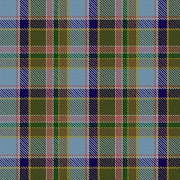 In 1980 the Guild adopted its current name and the tartan made its first appearance at the annual Arts and Craft Show. For 41 years we have been supporting spinners, weavers, knitters, felters and other fibre arts in the beautiful South Okanagan of B.C. Our 2018/19 Schedule is on the left side of the page and just below it, “Local Okanagan Resources”. 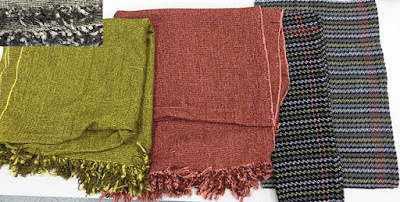 If you are new to weaving or unfamiliar with some terms, the sites Weave Structures and Plain Weave Variations will help. I like this article on Mixing Twills for its practical learning. You’ll find lots more reference material under Lynn’s Virtual Library on the left side of the page. Posts are published by calendar date of the event so look for them by visiting the Archives to the right or Older Posts at the end of each post. To return to our Home page at any time, just CLICK HERE. Enjoy and thank you for visiting! So many beautiful silk scarves by those who thoroughly enjoyed participating in the Silk Scarf Marbling Workshop. Here are some of the scarves that were presented by Sarita, Linda, Marg, Marie, Ivy, Celia, Nell, Marianne M, Diane, Barb P, Donna A, Doreen M, and Patricia. We had an amazing display of show and tell this month. These are some highlights. For many months we watched Jan P working on old UFO. This meeting we saw the spectacular completed hooked rug. a Twill weave structure with a 2/10 linen warp. Ilse used her stash for this silk scarf woven on 8 harnesses. jacket from her handspun yarn, woven yardage. Gail has woven six rugs since the beginning of Jan. The yellow/turquoise rug is for a friend's first great grandchild. of the variety of pages in the different books. warp (from 2015 Studio workshop) with a bamboo weft and twisted fringe. The draw twill required a light beat. dyes (Australia) to achieve these beautiful colours. an iron bath, and onions. The woven scarves on an 8 harness loom are tencel. This month our Show and Tell is an interesting mix of samplers, historical pieces, recycled fabrics, and new items. marigolds. Using t-shirts, she wove her first rag rugs. Ilse wove upholstery yardage to redo her DR chairs. The hand spun and dyed yarn is Romney and Samoid. weaving. The one on the right is our next project. create a bag and Easter baskets for her grandchildren. Gail wove these rugs on the loom made by her Stepfather for his Mother. One is for her grandson and the other for her daughter-in-law. Cynthia wove these tea towels in a thicker cotton, 6/2 at 16 epi. p.56. She notes there is an error in the treadling sequence. Zephyr merino wool on her 8 shaft loom. a level of complexity is revealed." as she prepares to start weaving again. was the result of hand dying experiment. coreopsis, golden rod and another (can't read my writing,lol). 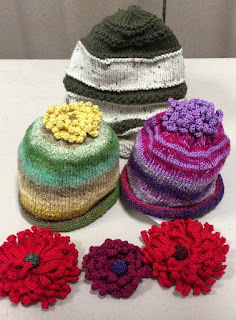 hats were a product of the Fair isle Knitting workshop. My thanks to Gail and Jen for the photos and notes from the meeting. Eva wove this acrylic yarn shawl in a rosepath pattern. used ihe yarn to knit fingerless gloves. The Guild members were very busy over the summer partly caused by lots of indoor time as a result of the smoke from the wildfires. I had 5 pages of notes! Following is a selection of the Show and Tell. from the other side getting caught. She then sewed them together (photo below). from wool purchased at a trunk show required a lot of blocking. Below, the wine, blue and white scarf was woven using merino wool. 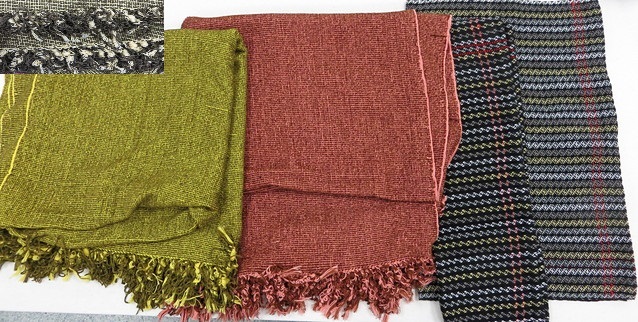 watch the beat for the green woven scarf. 2/8 tencel warp on 8 harness loom. in a two block twill pattern on her new 8 shaft loom. in a lace weight silk and wool yarn. scarf was 3 dye lots including using logwood and citric acid to lighten it. iron and other natural plants. part of the Owl challenge. Doreen knit block squared to create this lap blanket. using red Heart scrubby yarn and did some spinning as well. Our meetings are held at the Oliver Community Centre starting at 10am unless otherwise noted in the Schedule below. Email dssandwg@gmail.com for details. Russian Pattern Book By Dolivo-Dobrovolsky, V. A. 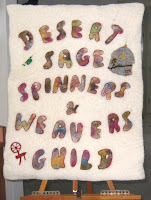 & A. G.
Our Felted Banner, a 2003 Guild Project along with the Yurt. For Sale – 45" Leclerc Mira counter-balance loom. This loom was built in the late 1950s and I have owned her since 2008. Comes with a brand new 10 dent reed, lease sticks and Angel Wings. $600. Located in Eagle Bay, BC (in the Shuswap). Please contact Janet at msmjsp@gmail.com for more information or photos. My focus is to showcase the talents of our members while providing educational information, one of the goals of our Guild. Marianne M. who was our original blog designer (until 2014) tells this amusing story: "The other night I was knitting and spinning yarns with my knitting group. I passed around a pattern requesting some help with interpreting it. One gal read an instruction "Beg at corner" which sent us all into hilarity. Sometimes patterns do that - make us feel ungrounded with a hand outstretched. Now that‘s a yarn worth telling."